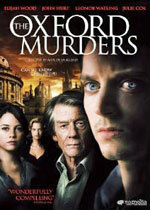 adapted as "The Oxford Murders"
Synopsis: On a summer’s day in Oxford, a young Argentine mathematics student finds his landlady – an elderly woman who helped decipher the Enigma Code during World War II – murdered in her house. Meanwhile, leading Oxford mathematician Arthur Seldom receives an anonymous note bearing a circle and the words, “the first of the series,” and a mystery is born. Murders begin to pile up – an old man on life-support is found dead with needle punctures in his throat; a percussionist at Blenheim Palace dies before the audience’s very eyes – seemingly unconnected except for notes appearing in the math department, for the attention of Seldom. Seldom guesses that the murders might relate to his latest book, an unexpected best-seller about the parallels between investigations of serial killers and certain mathematical theorems. As he and the young student are drawn further into the game, it is up to mentor and student to solve the puzzle before the killer strikes again. 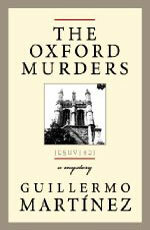 Additional notes: Originally published in Spanish as Crimenes imperceptibles in 2003.